With CM 6 there is no modem remote access or alarm notification, Have seen an issue where the customer has no alarm service configured and regularly received the following platform alarm even the subsequent alarm which may have caused it had cleared. SME MAJ Far end alarm service is down this alarm. Only way I could see of resolving it was by turning off the Master Agent from the CM web page, it has to be done on each server too. 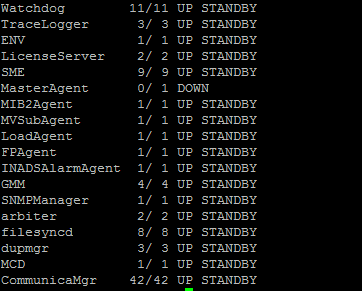 Server (Maintenance) / Agent Status (Under Alarms) click Stop Master Agent. Unfortunately whenever CM is restarted you have to do it all over again as it restarts the service. stop -s MasterAgent (it will ask you to confirm Y and a statapp will confirm is it off). Yes it disables SNMP alarming and that was the intent . . . believe it or not, not everybody is using SNMP for alarming. Sorry that you did not see your comment immediately but this is to prevent spam it has to be approved. I researched this further. Disabling the master agent also disables SNMP alarming, which is probably not the intent of your solution. I’m a little disappointed my previous question does not show up in a feedback pane of your blog. What do you lose when the master service is turned off? It must be there for some reason.